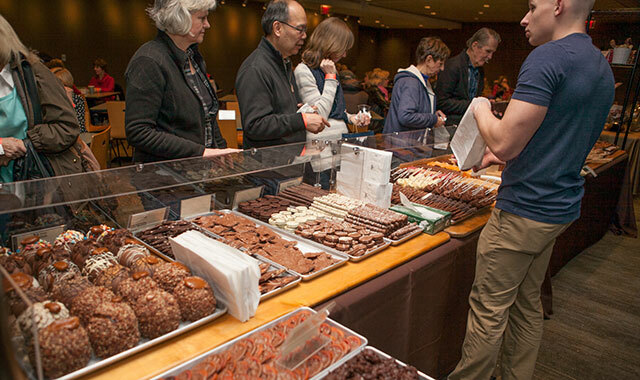 Sample an array of chocolates during Chocolate Weekend Feb. 9-10 at Morton Arboretum in Lisle. Feb. 1, 7-9 p.m. After a staff presentation about the Blandings turtle, capture the image of this endangered fellow on canvas with step-by-step instructions by a local artist. All supplies, light supplies and soft drinks provided. Welcome to BYO wine or beer. Reg. online. Prairieview Education Center, 2112 Behan Road, Crystal Lake, (815) 479-5779, mccdistrict.org. Feb. 2, 11:30 a.m.-1 p.m. Sing, dance and craft with special princess guests at this royal Valentine’s Day tea that features lunch, tea and entertainment. Reg. online. Blackberry Farm, 100 S. Barnes Road, Aurora, (630) 892-1550, foxvalleyparkdistrict.org. Feb. 2, 1-2 p.m. Play games, do crafts and enjoy refreshments and learn how turtles use their unique adaptations to survive the winter; then the turtles will predict the Super Bowl winner. Reg. online. Red Oak Nature Center, 2343 S. River St., Batavia, (630) 897-1808, foxvalleyparkdistrict.org. Feb. 2-3, events all day. The Midwest’s premier winter obstacle race challenges participants with 4-6 miles of snowy terrain, more than 20 winter-themed obstacles and potentially abominable weather. Blending fitness, family and fun, with lots to do before and after the race. Reg. online. Devil’s Head Resort, S6330 Bluff Road, Merrimac, Wis., (608) 493-2251, devilsheadresort.com. Feb. 5, 12:30-4:30 p.m. On Adlai E. Stevenson Day, drop in to learn about this Illinois governor and ambassador to the United Nations. See where he wrote speeches, reflected on world events and found solace in the landscape. Reg. online. 25200 N. St. Mary’s Road, Mettawa, (847) 367-6640, lcfpd.org. Feb. 5, 7-8 p.m. Bring the whole family out for an evening of games and other activities based on the topic of wildlife in winter. Reg. online. Lost Valley Visitor Center, Glacial Park, 6316 Harts Road, Ringwood, (815) 678-4532, mccdistrict.org. Feb. 6, 6:30-8:30 p.m. Pinot Noir meets the palette as an instructor guides you through your own custom canvas creation. Bring a bottle of your favorite wine, snacks and some friends; materials included. Blackberry Farm, Aurora, (630) 892-1550, foxvalleyparkdistrict.org. Feb. 8, 6-8 p.m. Grab a poodle skirt for your daughter and travel back to the ‘50s for an evening of dinner, dancing and crafts at this sock hop; children ages 4-10. Reg. online. Grand Oaks, 1401 Ill. Rt. 176, Crystal Lake, (815) 459-0680, crystallakeparks.org. Feb. 8, 6:30-7:30 p.m. Celebrate Valentine’s by making your own organic scrubs and bath products to take home. Materials, light snacks and beverages provided. Reg. online. Prisco Community Center, 150 W. Illinois Ave., Aurora, (630) 859-8606, foxvalleyparkdistrict.org. Feb. 9, noon-1:30 p.m. Bring your sweetheart for a lovely luncheon tea and chocolate treats. Tables of four available; ages 4 and up. Reg online. Colonel Palmer House, 660 E. Terra Cotta Ave., Crystal Lake, (815) 477-5873, crystallakeparks.org. Feb. 9, noon-4 p.m. Celebrate all things winter with games, crafts, exploration and scavenger hunts. Rent snowshoes and enjoy the fresh air. Snacks and hot chocolate served. Lost Valley Visitor Center, Glacial Park, Ringwood, (815) 678-4532, mccdistrict.org. Feb. 9, 5:30-9 p.m. Drop off the kids for an evening of activities, pizza and a movie while you enjoy some adult time. Participants are welcome to bring a blanket or stuffed animal for movie time. Reg. online. Red Oak Nature Center, Batavia, (630) 897-1808, foxvalleyparkdistrict.org. Feb. 9-10, 9 a.m.-4 p.m. Celebrate chocolate’s deeply-rooted tree history as you sample an array of chocolate items, which are for sale for your Valentine or yourself. Tickets online. Morton Arboretum, 4100 Ill. Rt. 53, Lisle, (630) 968-0074, mortonarb.org. Feb. 9-March 24, 10 a.m.-4 p.m. Capture the spirit of the South Pacific as you admire more than 10,000 orchids in bloom, along with bromeliads and birds of paradise, in a lush, tropical setting with palm trees and forest canopies teeming with color and life. Chicago Botanic Garden, 1000 Lake Cook Road, Glencoe, (847) 835-5440, chicagobotanic.org. Feb. 10, 7 a.m. Bundle up and head for Crystal Lake to try your hand at ice fishing. Participants over 16 must have a valid Illinois fishing license. West Beach, 2330 Lake Avenue, Crystal Lake, (815) 459-0608, crystallakeparks.org. Feb. 10 & 24, 9:30 a.m. & 1 p.m. Have you wondered what plant vanilla comes from? Participants ages 4-10 and an adult put together some easy-to-make fruity treats like smoothies and flavored shaved ice, and take home the recipes. Learning Center ITW Kitchen, Chicago Botanic Garden, Glencoe, (847) 835-5440, chicagobotanic.org. Feb. 10, 17 & 24, noon. Bountiful buffets with live music. Oscar Swan Country Inn, 1800 W. State St., Geneva, (630) 232-0173, oscarswan.com. Feb. 10, 4-7 p.m. Do you enjoy random, useless facts? Has your love of such information gone unappreciated for too long? Come join like-minded folks as teams compete for the first-place trophy. Sandwiches and snacks included; cash bar available. Register your team online. Arlington Lakes Golf Club, 1211 S. Wilke Road, Arlington Heights, (847) 255-1225, ahmuseum.org. Feb. 12, Mother/son program, 5:45-6:30 p.m., father/daughter program 6:45-7:30 p.m. Bring your special Valentine, ages 1-5, and enjoy musical activities about Valentine’s Day, hearts, friendship, chocolate, flowers and more. Reg. online. Cantigny, 1S151 Winfield Road, Wheaton, (630) 668-5161, cantigny.org. Feb. 15, 5-9:30 p.m. Summer-style fun in the middle of winter for kids 6-12; an evening of crafts, critter visits and a pizza dinner while parents have an evening out. Hickory Knolls Discovery Center, 3795 Campton Hills Road, St. Charles, (630) 513-4399, stcparks.org. Feb. 15-16, 5-9 p.m. Don your cross-country skis and explore trails lit only by candlelight, then enjoy refreshments around a campfire. Reg. online. Should there not be enough snow, enjoy a candlelight hike instead. Prairieview Education Center, Crystal Lake, (815) 479-5779, mccdistrict.org. Feb. 16, 11 a.m.-2 p.m. Entertainment, games, program demos, inflatables, food and raffles. Vaughan Athletic Center, 2121 W. Indian Trail, Aurora, (630) 907-9600, foxvalleyparkdistrict.org. Feb. 16, 2-5 p.m. Many vendors featuring all wedding categories. Reg. online. Main Beach, 300 Lakeshore Dr., Crystal Lake, crystallakeparks.org. Feb. 16 & March 16, 9-10:15 a.m. Children ages 8-13 wave their wands and create magical projects such as unicorn blood, liquid luck and troll boogers or a Hogwarts silhouette collage and acrylic painting. Reg. online. Grand Oaks, Crystal Lake, (815) 459-0608, crystallakeparks.org. Feb. 16-17, 11 a.m.-3 p.m. Drop in to the Children’s Garden to make a tasty treat to hang on the trees for our favorite feathered friends. Morton Arboretum, Lisle, (630) 968-0074, mortonarb.org. Feb. 19, 5:30-7 p.m. Enjoy a pizza dinner as you watch the moon rise from the warmth and comfort of the education center’s vista room. Share stories and lore of the season, the night and the moon. Optional hike in the moonlight if weather permits. Reg. online Prairieview Education Center, Crystal Lake, (815) 479-5779, mccdistrict.org. Feb. 21, 10-11 a.m. Have an hour of fun with a game, craft and educational activities based upon the theme of the day. Reg. online. Lost Valley Visitor Center, Glacial Park, Ringwood, (815) 678-4532, mccdistrict.org. Feb. 23-24, see website for times. Learn about birds and decorate a wooden birdhouse to take home. Discover some winter birds on a short walk through the woods. Reg. online. Morton Arboretum, Lisle, (630) 968-0074, mortonarb.org. Feb. 24, 2:30-p.m. Enjoy a walk in the crisp air, activities and discovering winter wonders. Dress for wintry trail conditions. Reg. online. Pleasant Valley Conservation Area, 13315 Pleasant Valley Road, Woodstock, (815) 338-6223, mccdistrict.org. March 2-3, 10 a.m.-3 p.m. Hear stories of how maple syrup was made hundreds of years ago; discover how maple trees produce sap each spring and how it’s collected; see how the syrup is made at the evaporator house and then taste a sample. Coral Woods, 7400 Somerset, Marengo, (815) 479-5779, mccdistrict.org. March 8, 6 p.m. Bring your son (ages 4-10) and harken back to the ‘80s with a night of dinner, dancing and crafts. Reg. online. Grand Oaks, Crystal Lake, (815) 459-0680, crystallakeparks.org. March 9, noon-3 p.m. In honor of Women’s History Month, celebrate the 19th Amendment, which granted women the right to vote. Make suffragette sashes and pins, and learn about women who have influenced history. McCormick House Gold Theater, Cantigny, Wheaton, (630) 668-5161, cantigny.org. March 9-10, Sat. 10 a.m.-5 p.m., Sun. to 4 p.m. Fifty-five dealers from 15 states offer antiques. Kane County Fairgrounds, 525 Randall Road, St. Charles, (630) 584-6926, kanecountyfair.com. March 9-24, Sat. See website. Ryerson Woods is one of the few places in Lake County where climate conditions are right for maple syrup production. Learn about the process and taste the real thing. Ryerson Woods Conservation Area & Visitor Center, 21950 N. Riverwoods Road, Riverwoods, (847) 968-3321, lcfpd.org. This entry was posted on Tuesday, January 29th, 2019 at 11:57 am	and is filed under Recreation & Destinations. You can follow any responses to this entry through the RSS 2.0 feed. Both comments and pings are currently closed.